Ships began wrecking along the Florida Reef since the early in the 16th century. Spanish ships returning from the New World laden with gold and silver, sailed from South America to catch the Gulf Stream home. Here they passed close to the reefs along the Florida Keys. Aprroximately five percent of these ships sunk along Florida's coastline. In the early 18th century, it was the custom of Spanish ships filled with gold and silver from South America, to gather on the Florida coast near Sebastian Inlet, on the eastern coast of Florida. Here the captains would wait to form convoys for protection against pirate attacks. In late summer of 1715, late arrivals delayed the formation of the convoy, and it was not until the beginning of the hurricane season that the eleven ships set sail for home. They were soon hit by a violent hurricane that sank all but one of the ships and scattered their amazing gold and silver treasures on the ocean floor about a half of a mile off shore. 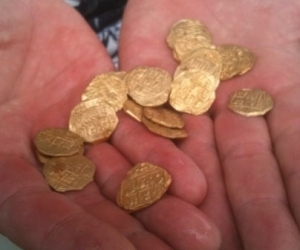 July 2010 - PALM BEACH, FLORIDA - A bounty was discovered inside a 300-year-old bronze cannon that had been handed over to historians for further for study. The cannon was part of a 1715 Spanish shipwreck off the east coast of Florida. The ship was on it's way back to Spain when it sunk during a hurricane. This latest treasure is valued at over $500,000. Treasure hunters said the cannon was an amazing find in it's own right. The cannon was discovered in shallow waters close to shore, approximately twenty miles north of West Palm Beach. It was found near a pile of gold coins. Among the gold coins was an extremely rare 1698 Cuzco mint coin from a Peruvian mine. Historians have struggled for many years to discover more information about the mine, of which very little is known. Other found coins appear to be primarily from Colombia, Mexico and Bolivia.